Hello everyone. We’re on the countdown to New Zealand Babywearing Week (10 – 16 October 2011) and we are looking forward to celebrating with you. We’ve been loving the giveaways over the last couple of months thanks to some generous product sponsors. The next giveaway will be drawn once we reach 800 page members over on the New Zealand Babywearing Week facebook page. Our 800 liker giveaway sponsor is My Natural Baby Ltd. One lucky ‘New Zealand Babywearing Week Facebook page’ member will be randomly drawn to take home a Storchenwiege Woven Ring Sling valued at $140.00 in their choice of colour from available colourways . (Open to NZ residents only). The Storchenwiege® RingSling comes with detailed instructions on how to wear it and a washing bag to protect your washing machine and the Storchenwiege® RingSling aluminium rings. The Storchenwiege® RingSling can be washed at up to 60°C. Please use the enclosed washing bag to protect your washing machine and the aluminium rings. Leave a comment under this post to let us know your favourite Storchenwiege ring sling colourway (view available Storchenwiege ring sling colours on the My Natural Baby website) and why you would like to win one. This entry was posted in Giveaways and tagged babywearing, My Natural Baby, ring slings, storchenwiege, Storchenwiege ring slings. Bookmark the permalink. So pretty!!! My favourite is the Inka – but a very close second is the Anna – both so lovely! I like to win one because Im pregnant with a baby boy due in less than 7 weeks and Ive got no transport. We dont have public transport here. My oldest son didn’t enjoy hip-carries and so I only had an ergo. My second boy loves to be on my hip. I think we’d get a lot of use from a ring sling. I’d love to win an Anna colourway, but really any one would be AWESOME! I haven’t been able to find my ring sling – I think it got lost or packed somewhere on the move from Oz to NZ, and my 8mo is now at the perfect age for a ring sling. It would be magnificent to have a new sling so I could wrangle the other 2 kids a little easier. i’ve seen so many mothers having this and i would love to win and try it. My Fav colour is Bio Eric, and I would love to win a Storchenwiege woven ring sling because our ring sling is so old and tatty now its freying along the edges because its used so often! Def time for a new one!! I would love a Leo – Black & White as it would go with any outfit, any colour, formal or casual! I like both pages and have tagged you in my status. I have to say I love the inca too. I like to carry our 6 monther on my back, front and hip depending on what we’re doing and a ring sling would be perfect for our hip carrying activities. Thanks!! 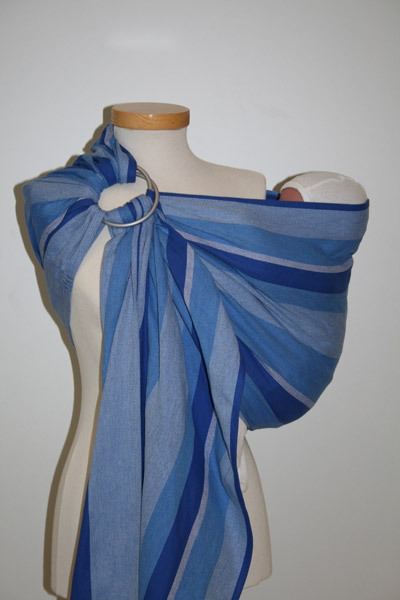 You can do front and back carries with a ring sling too ;0) Thanks for your entry and good luck for the draw! My fav colour is Inka too 🙂 I’m using a home made sling at the moment and would love a snuggly cuddly storchenwiege to take with me on my upcoming trip to the Uk. Ith just me and my 1yr old on a 24hour flight it would be invaluable during airport transfers and we would get a lot of use out of it once we’re back home!! 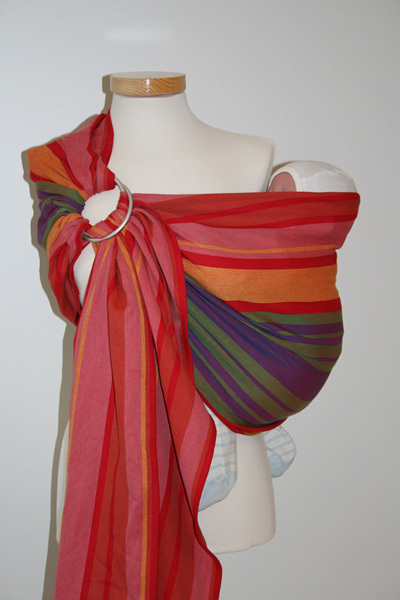 I want a pretty sling in time for the Auckland Babywearing Walk too!! !